Mother’s Day Lunch [recipes] – Cin Cin, Let's Eat! Hope everyone had a great weekend and was able to celebrate with the Moms in your life. For Mother’s Day this year, I hosted a lunch at my house for my parents, my sister’s family, and my Mom-in-law. The menu consisted of brunch-like items. Smoked salmon hash with poached eggs on top, vegetable ratatouille served on grilled baguette slices topped with buttery burrata cheese, and grilled bratwursts and chicken sausages. To wash down all the grub, we enjoyed a nice bottle of rosé (2010 Fantasia from Castello di Amorosa) which was very sweet and low in alcohol, a bottle of the nicest champagne I have in my possession from Mumm Napa (2001 DVX), and a sparkly grapefruit-strawberry-mint faux-mojito for the non-drinkers. As usual, with all the prepping going on, I only managed to snap a few pretty pictures for you, a couple were taken by my phone with instagram filters. Don’t you just love all the colors? Check out the Sandwicherie for all her gorgeous shots on this recipe! I didn’t use cream cheese like the recipe indicated. Joe charred up some slices of French baguette, and I let my guests assembled their own sandwiches. Burrata cheese was place alongside the bread so people had the option to either schmear the baguette with it or simply place a dollop on top of the vegetables. Burrata was a nice addition to the dish, it’s buttery quality added a layer of richness to the dish, yet it did not overpower the essence of the vegetables. 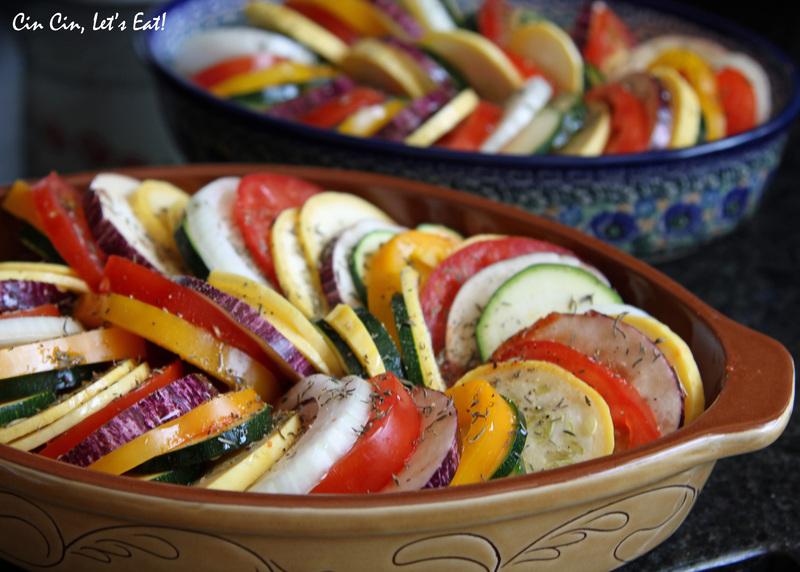 The ratatouille can be assembled a day in advance, and can be baked hours prior to serving as it is perfectly delicious at a lukewarm temperature. It’s a great dish for potluck as well, guarantee to be a huge hit! 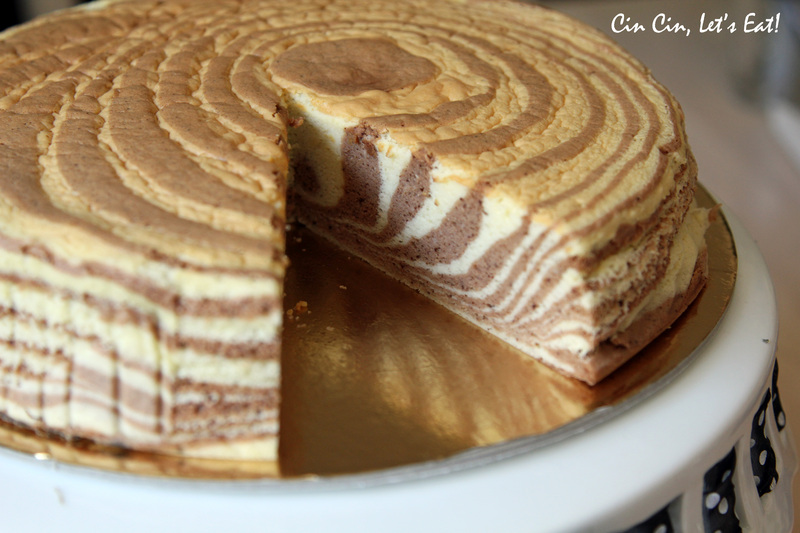 For dessert, I tested out a really visually awesome dessert I came across on Pinterest – Zebra Cheesecake from NotQuiteNigella. I’m such a sucker for animal prints, and the beautifully arranged pattern is just too hard to resist. Come on, look at it! Even if it doesn’t taste good, it still looks stunning! And by the way, it tasted AMAZING! It’s not the typical cheesecake one would have in mind. It’s very light, airy, and cake-like; Similar to a Japanese-style cheesecake but even lighter. 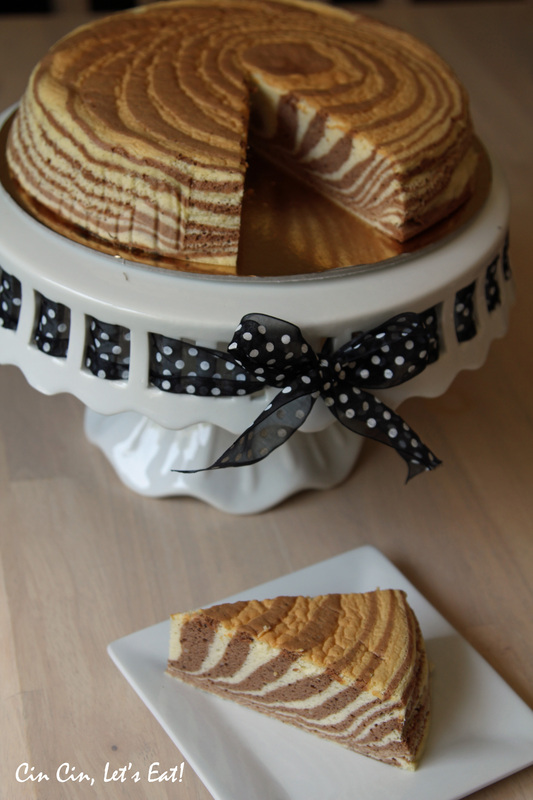 Think of it as a slightly denser and creamier chiffon cake. The ingredients don’t need to be adjusted, they’re perfect the way it is. The one thing I did differently- It takes a long time to preheat the oven with a tray of water in it. Plus there is the potential spillage of boiling water when you try to place the cake pan onto the baking tray. So I left the tray out until I was done with filling the cake pan, then placed the cake pan on top of the tray and both went into the oven together. The last step is to fill the tray with very hot water. I was worried during the process of alternating of chocolate and cream batter. The batter didn’t stay in the center of the pan as it spread only towards one side. But have no fear! 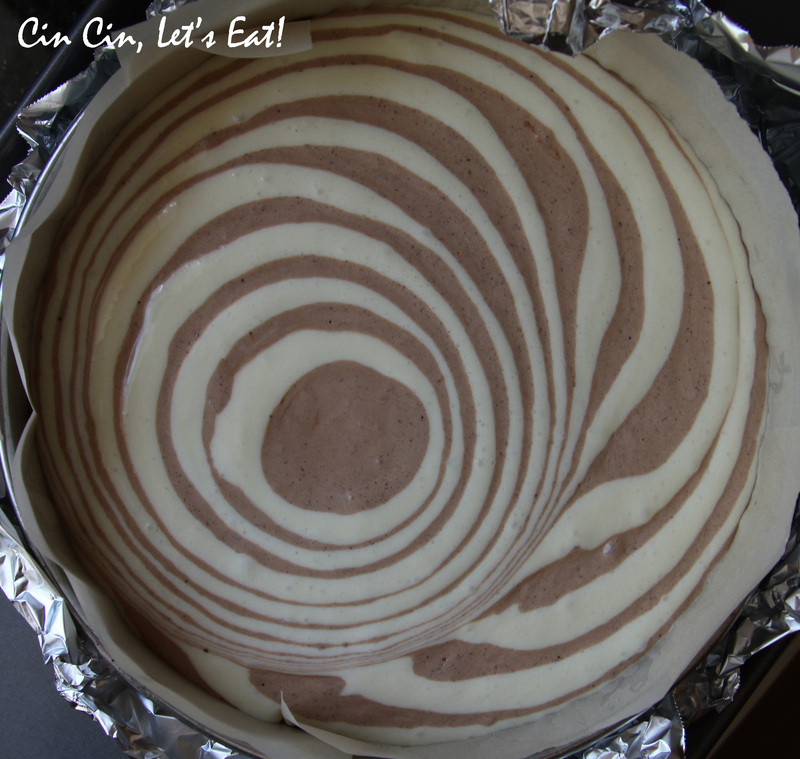 Keep going and the batter eventually spread evenly throughout the pan. I actually liked the unique and non-uniformed look better. Since the cake isn’t very sweet, it will pair very nicely with a drizzle of chocolate, caramel, or berry puree. I served it with a simple macerated berry fruit salad with mint. The cake will also pair deliciously with sweet dessert wine. Something I picked up for all the Moms at lunch. Syoubu Mochi from Minamoto Kitchoan. The prettiest packaging ever, with paper irises on top of the mochi. I bought them at the J Sweets counter at Mitsuwa Japanese Market in San Jose, CA. They sell lots of famous Japanese confections, shipped directly from Japan, and every single item they sell are extremely delicate and beautiful (and costly, too! ), too pretty to eat! 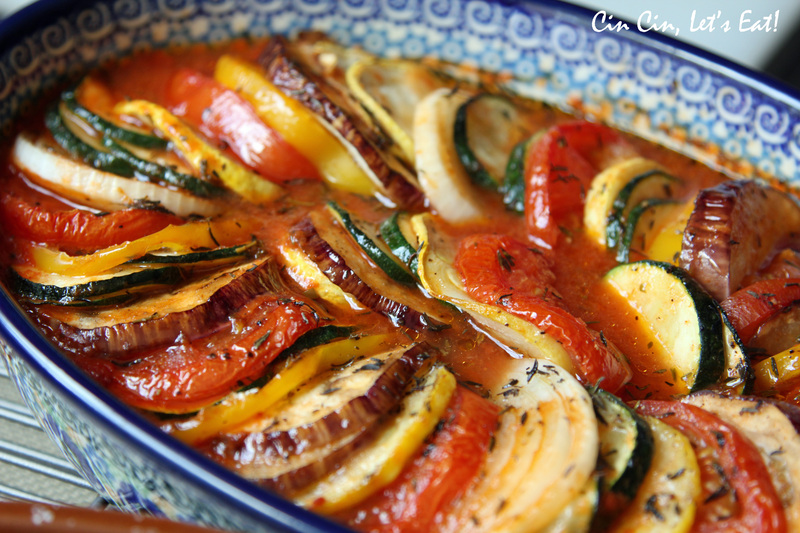 the ratatouille with burrata cheese and toasted bread has me drooling! when i first saw your picture of the zebra cheesecake, i was wonderfing if it’s possible to make them into mini cheesecakes. however, after reading the recipe, it looks a bit complicated for my skills!